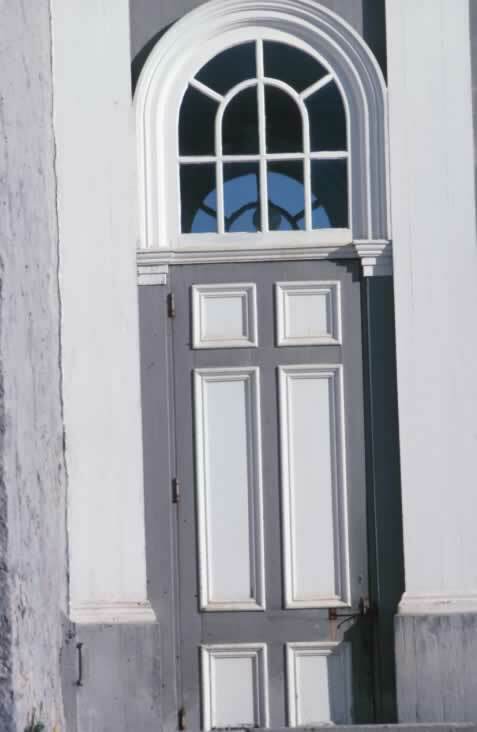 This six panel exterior door appears even taller because of the tall fanlight that sits atop the transom. The door, the doorway, and the wall above the fanlight has been painted gray. The door is considered a Christian or cross-and-Bible door because of the arrangement of the panels. Each pair of white panels are in a different size. The first rail below the door's top rail and the door's muntin (the space between the top four panels) form the cross. The cross is even more pronounced because the panels are trimmed in bolection, a type of raised molding that has also been painted white. Some Christian doors' panels are not quite so elongated. This door's bottom two panels are the smallest panels; these panels form the cross. Hardware includes a lever handle and a set of three exterior-pin hinges.